Freddie Mercury has always been considered larger than life, and a 15-foot bronze statue of the late Queen singer has helped add to that perspective for the past eight years from its regular home in front of the Dominion Theatre in London’s West End. The 15-foot bronze Freddie was on the move this week from London to Liverpool, where the Liverpool Echo reports it has arrived in the city to celebrate the hit Queen and Ben Elton musical, “We Will Rock You,” which will run at the city’s Empire Theatre in September. The London landmark, to which thousands of fans flock yearly to pay their hero a visit, is sure to turn heads in the famed hometown of The Beatles; it will tower above shoppers on Paradise Street until the end of June to help promote the musical. The statue was originally intended to stand on the canopy at the Empire Theatre, but it was too heavy. In response to the appeal to "find Freddie a home," Liverpool One agreed to take him in. "We are delighted to welcome Giant Freddie,” said Chris Bliss, estate director at Liverpool One. “The statue is iconic and we’re sure shoppers and visitors to Liverpool One will be thrilled to see him here in the city centre." 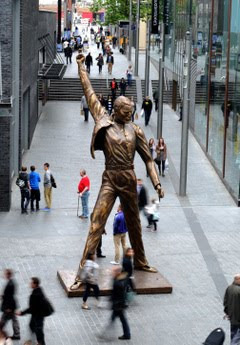 "Our city is often referred to as the World Capital of Pop,” said Andrew Rawlinson, Liverpool Empire general manager, “so I think the bustling streets of Liverpool One will make a very fitting spot for Freddie. This show has audiences rocking wherever it goes and I’m sure Liverpool will be no exception."